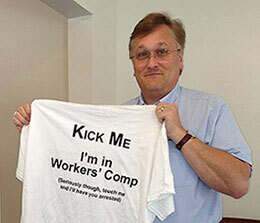 In Florida Workers' Compensation Reform, a Swing and a Miss? On a conference panel almost 3 years ago, after the Castellanos decision that found Florida's plaintiff attorney fee caps unconstitutional, I predicted that the state legislature would respond with quiet deportment, waiting several years doing nothing until the pain became unbearable, and then would do something colossally stupid. That prediction wasn't entirely accurate. The pain, as measured by employer workers' compensation premium dollars, has not yet become unbearable, and the Florida legislature has at least attempted to do something. They keep failing at it, but they do attempt it. This year's efforts are particularly interesting, since the two bills being considered by each chamber in the legislature have very little in common. The House Bill, HB 1399 has been moving through committees with apparently strong support, while the Senate Bill, SB 1636, appears to have been abandoned on a park bench near the Tallahassee bus station. Ok, that is a bit of an exaggeration. It looks as though it has stalled in the Banking and Insurance Committee, having twice been “temporarily postponed” on the agenda. That means that somewhere in a back room of the Capitol, someone is holding a pillow over its face hoping the damn thing dies. Mandates a specified notice regarding attorney fees be signed by the claimant. Requires a good faith effort by the claimant and their attorney to resolve disputes prior to filing a petition for benefits. Increases the requirements applicable to petitions for benefits. Increases total combined temporary wage replacement benefits (TTD/TPD) from 104 weeks to 260 weeks. Fills a benefit gap that happens when TTD/TPD ends, but the injured worker is not at overall maximum medical improvement and/or does not have an overall permanent impairment rating. Eliminates the charge-based reimbursement of health care facility outpatient medical care in favor of reimbursing them at 200 percent (unscheduled care) and 160 percent (scheduled surgery) of Medicare. If no Medicare fee exists, then current reimbursement standards apply, which are incorporated into statute. Most notable in HB 1399 is it addresses the TTD issue created by the Westphal decision, as well as provides for potential benefit lapses in those few cases where the time has elapsed, and the worker is not yet at MMI. The bill also ties hospital and outpatient clinics to a fee schedule where currently none exists. It is interesting to note that the sponsor of HB 1399, State Representative Cord Byrd, an attorney, is on record as “philosophically opposing any caps.” That philosophy seems reserved just for attorneys. Capping medical fees doesn't seem to be an issue. I don't have a problem with his proposal, I just find it somewhat ironic. Other elements of HB1399, relating to specificity and process, seem sound on paper but may have the effect of slowing care in an already cumbersome system. Senate Bill 1636, on the other hand, takes an entirely different approach. It is more a blast from the past, as it contains (wait for it)…. Caps on injured worker attorney fees! Florida recently saw a dramatic shift in its Supreme Court, with some of our more liberal justices forced into retirement by mandatory age caps. Our newly ensconced Governor has replaced them with justices perceived to be more conservative, so some in the state think that injured worker attorney fee caps will withstand the obligatory court challenge this time around. It is somewhat similar to children with a hot stove and a different baby sitter. Sure, it burned us last time, but the new caretakers will undoubtedly let us try it again. The bill would allow injured workers to enter into direct payment situations with an attorney, allow an alternative minimum attorney fee cap on medical-only claims of $150 per hour, not to exceed $1,500, in all medical only claims rather than only once per accident. It would also limit appellate fees at $150 per hour if certain conditions are met. I'm not a fan of litigation, and I think there are those who abuse the system in that field. However, focusing heavily on attorney fees is merely treating a symptom that fails to address bigger issues within the system. Nothing in this bill facilitates prompt and proper care, and that is what would ultimately reduce legal expenses in this industry. If you really want to reduce needless litigation, you should create a system that makes litigation unneeded. With its unrelenting focus on injured worker attorney fees, SB 1636 is following failed efforts not just within Florida, but other states as well, and would help create a system where injured workers may not have the protection they need from nefarious actors who do not honor their obligations. It is probably good that they've left it at the bus station – for now at least. So, for Florida, the oddsmakers are going with a “swing and a miss” this time around. It is possible that the Senate side may see some movement, and that they may be able to reconcile those two bills, but it seems unlikely at this point. But my fellow Floridians should not despair. Just like fans of the Buccaneers or the Tampa Bay Ray's already know, there is always next year.